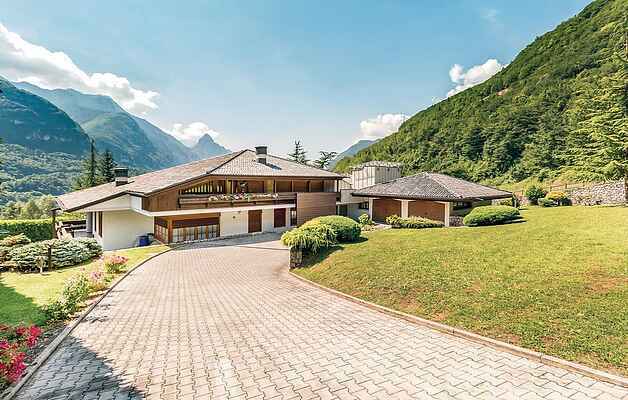 This majestic mountain cottage with indoor pool is located near the picturesque village of Castellavazzo, in a wonderful position, surrounded by greenery and close to the Dolomites. The villa has a beautiful private garden, where you can enjoy breakfast or have a barbecue with your family or friends. Thanks to its favourable location, you can reach in about half an hour Cortina d'Ampezzo and in fifteen minutes the Val Zoldana, both renowned resorts and a paradise for summer and winter sports, nestled in the spectacular mountains of the Dolomites. A few kilometres from here are also the Belluno Valley (Belluno and Feltre) and Lake Santacroce, the second largest lake in the region Veneto, ideal for water sports such as windsurfing, surfing kit, sailing, canoeing, fishing, but also for horseback riding. The villa is located about an hour from the charming town of Venice and about an hour from the pretty hilltop towns of Vittorio Veneto with its beautiful Sanctuary of Santa Augusta, the Piazza Flaminio with its arcades and the castle of San Martino, Conegliano with its beautiful cathedral with frescoes, the Sarcinelli Palace which often hosts interesting exhibitions, Valdobbiadene with its cathedral. All these interesting places are characterized by their Venetian Villas and Castles on the famous Strada del Prosecco.